Just about everyone in the space at the Beverly Wilshire Hotel was patting away tears. The General — our general — was in the middle of delivering an impassioned speech about beauty and about how, despite having physical attributes that run contrary to traditional American beauty standards, as a child she was embraced by a majestic-looking woman 31 years ago with long flowing braids who cupped her face in her hands and told her she was beautiful. And there wasn’t a dry eye in the house. That woman, said actor Danai Gurira — whom the world now is coming to know as General Okoye from Marvel’s Black Panther — was Susan Taylor, the legendary editor who ran Essence magazine for many years. It was appropriate that Gurira was honored by the magazine at its 11th annual event that always happens the week of the Academy Awards. The luncheon is preamble to the big event, and in many ways is as significant as the Academy Awards themselves. It was the place where Lupita Nyong’o delivered a powerful speech about being a dark-skinned little girl in 2014 — days before she would go on to win an Oscar for her portrayal of Patsy in 12 Years A Slave — a speech that had everyone in the room that year nodding their heads in understanding, regardless of the actual hue of their skin. Tiffany Haddish speaks onstage during the 2018 Essence Black Women in Hollywood Oscars Luncheon at the Beverly Wilshire Hotel on March 1 in Beverly Hills, California. This event is a safe space. And it’s a place where black women are celebrated by the communities that cultivate them, inspire them and uplift them even when the rest of the industry doesn’t know to do any of those things. It’s a place where before Gurira even launched into her beautiful, tear-inspiring speech, she led everyone into the Stevie Wonder version of the “Happy Birthday” song for Nyong’o, who turned 35 this week. This year, the event also honored Tessa Thompson — who talked about how awful she felt about the advantages lighter-skinned women in this industry have, and how she loved existing in a time where diverse representations of black womanliness was ever-present. Tiffany Haddish brought laughter and levity despite talking about having been a foster child and a homeless adult. Lena Waithe talked about being a gay black woman from the South Side of Chicago who grew up loving the Wizard of Oz because of a scene where the Good Witch tells the munchkins to “come out,” a refrain Waithe repeated while asking others in the room — in the industry — to embrace who they are regardless of fear. “They were forced to hide in hopes that one day we wouldn’t have to and now look at us, still hiding. Being a gay black female is not a revolutionary act,” Waithe said, talking about the black LGBT community that came before her. “Being proud to be a gay black female is.” And, of course, Gurira also talked about the power that Black Panther is having on young kids. 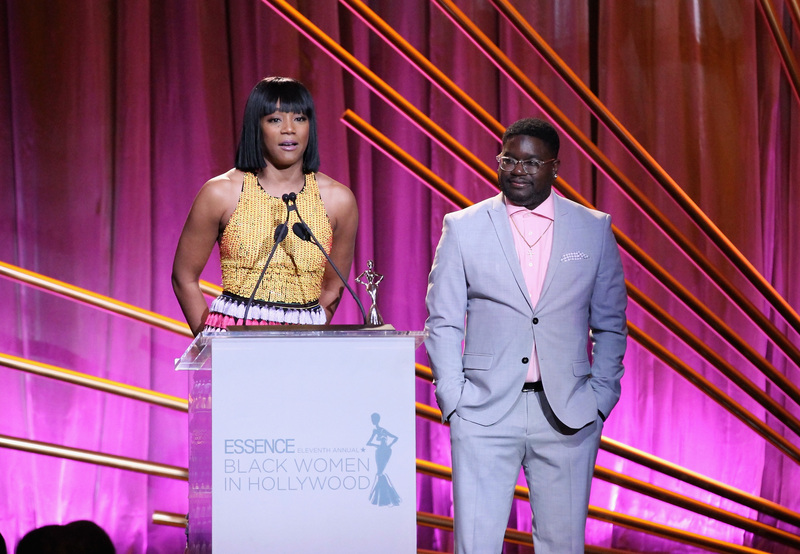 Each of the afternoon’s honorees were presented by someone remarkable: Gurira was honored by Nyong’o, Thompson was honored by Janelle Monae, Waithe was honored by Justin Simien and Angela Bassett and Haddish was honored by Lil Rel Howery. The event was hosted by Yvonne Orji and will air on OWN on Saturday at 10 p.m.
11:00 AMEmlen Tunnell was the first black player to be inducted into the Pro Football Hall of Fame. His story: Tunnell, born in Philadelphia, played football at the University of Toledo in 1942. He suffered a broken neck, which cut short his season, but he recovered in time to lead Toledo’s men’s basketball team to the National Invitation Tournament finals in 1943. He attempted to enlist in the U.S. Army and Navy during World War II but was denied because of his neck injury. He joined the U.S. Coast Guard and served from 1943-46. He finished his college career at the University of Iowa from 1946-47. He signed with the New York Giants in 1948, becoming the first black player to do so. He played defensive halfback and safety with the Giants until 1958 and spent his final three seasons with the Green Bay Packers, retiring in 1962. He played in nine Pro Bowls over his 14-year career and was part of two NFL championship teams in 1956 and ’61. His 79 career interceptions were an NFL record when he retired. He was inducted into the Pro Football Hall of Fame in 1967, the first black player and first pure defensive player to be enshrined. He remained with the Giants from 1963-74 as a special assistant coach and defensive backs coach. (1965–1974). Fast fact: His nickname was Emlen the Gremlin. Quotable: Tunnell’s Packers teammates often came to him for guidance. “I’m old enough to preside over them, but still young enough to be part of them,” he said.